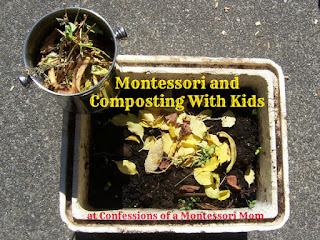 When I was a Montessori teacher for 20 years I learned how to compost with the children at our Montessori school. 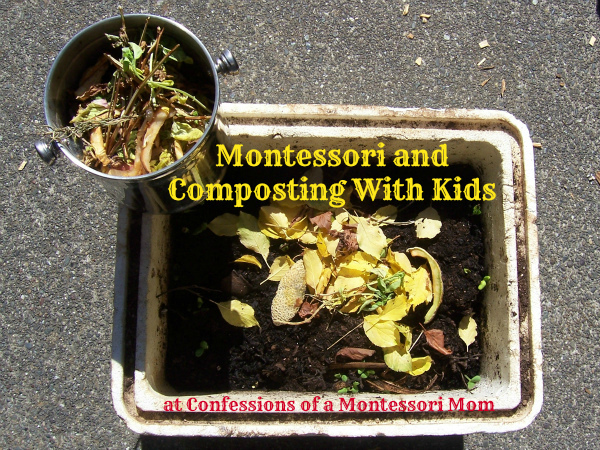 Now that I am a work-at-home mom, and my son is older, I started composting with him this summer: I combined what I learned as a Montessori teacher with what I had around the house. First I grabbed an old styrofoam ice chest that was taking up room in our garage. I poked holes in all the sides, including the bottom, with a large screw driver. 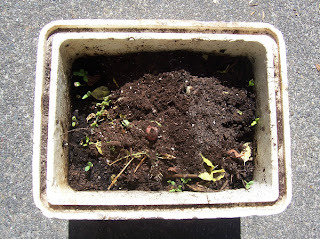 Then I layered a little soil and manure on the bottom and watered it just a tad. Next, I got a basket with handles for my son to gather "brown waste" from our yard: leaves and dried grasses and small sticks. 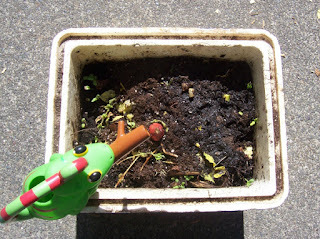 We then retrieved our kitchen-counter compost and poured some "green waste" on the compost. FYI: No dairy or meat go in the compost. So now we have both brown and green waste together. That's important for a healthy compost! Next we added a few cups of soil. It is not necessary to add soil. 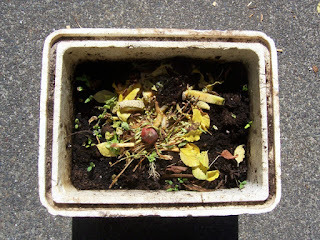 I use it to help the compost decompose faster, and to give my son a job to do on a regular basis as part of composting. Then we added some chicken manure. It is not necessary to add manure. 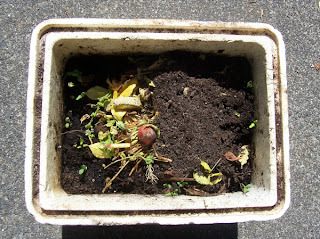 I use it to help the compost decompose faster, and to give my son a job to do on a regular basis as part of composting. FYI: There are other manures you can use. We came back and turned it with a large wooden spoon (later we used a garden tool with four prongs in it). 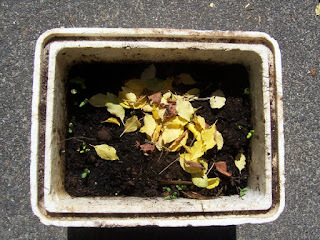 You do not have to turn your compost. We turn our compost once or twice a week to help it decompose faster, and to give my son a job to do on a regular basis as part of composting. 1. Use materials that are child-sized. 2. 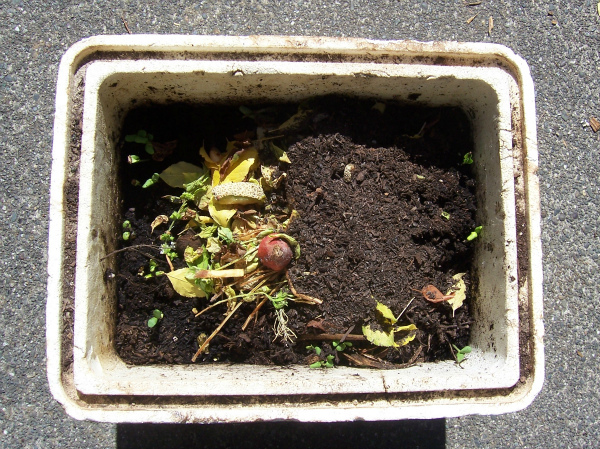 Allow the child to choose to do composting as an everyday activity including taking out the kitchen scraps and gathering "brown waste" from the yard. Child should also wash hands when finished. 3. Talk about what's going on inside the compost. Get books from the library about composting, earth worms, slugs, and fungi. 4. Use the compost material when it's time to plant in the garden in the Spring time. 5. Help the child to take care of all the materials, cleaning them when necessary, and putting them away when finished using them. 6. Allow the child to turn the compost once or twice a week. 6. Botany/plant card sets (classified botany card sets): parts of a tree, parts of a flower, parts of a leaf, parts of a root. Montessori Botany YouTube clips: 6 to 9 Botany Charts here, 3 to 6 Sciences here. PDF download from DinnerGarden.org: "Home Grown Edible Landscapes: Seed Harvesting and Saving." Great pics of parts of a vascular plant, parts of a flower, info on how the plant produces seeds, pollination, seed parts and their functions, monocots, dicots... Great resource! 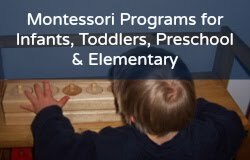 My affordable online Montessori programs for birth to age nine!